(Shredder has just realized who this giant rat is.) Yes, Oroku Saki. I know who you are. We met many years ago, in the home of my master, Hamato Yoshi! April O'Neill: And then there's Casey Jones, a nine-year-old trapped in a man's body. He might be cute except for that pigheadedness. April: Is Raph coming back? April: What did you do, did you take classes in insensitivity? Casey Jones: I was just trying to break it to you easy. April: Oh, well, you failed miserably! Casey Jones: Hey, Broadzilla, you wouldn't even be standing here if it weren't for me. April: And what do you want? Do you want a thank you? Casey Jones: No, it's me who should thank you for that privilege, right? April: Will I ever see you guys again? Leonardo: Well, that depends on how fast you stock your pizza. Casey Jones: New game, round-head. Cricket? Raphael: Cricket? Nobody understands cricket. You gotta know what a crumpet is to understand cricket. Casey Jones: Not even close, Zip Neck. Professor and Mary Anne. Happily ever after. Donatello: No way, Atomic Mouth, Gilligan was her main man. They'd be married and have six kids by now. Casey Jones: Gilligan was a geek, Barfaroni! Donatello: You're the geek, Camel Breath! Casey Jones: Okay let's give this a try, funkoid! Donatello: Here it goes. What are we on? Donatello: Here it goes, gak face! Casey Jones: I'm ready, hose brain! Chief Sterns: We are presently executing a plan of redeployment that will minimize response time while maximizing coordination between patrol units in a decentralized networking scheme. April: I'm not sure I understood all of that, Chief Sterns. Would you mind repeating it, in English perhaps? Danny: I think there's some left over pizza from the other night. Donatello: Do you like penicillin on your pizza? Michelangelo: Mmm-hmm. Pizza dude's got thirty seconds. 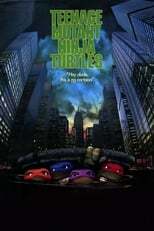 Donatello: Hey, Mikey...You ever think about what Splinter said? About, y'know...Us not havin' him? Michelangelo: ...Well, time's up. Three bucks off. Casey Jones: You want a fist in the mouth? I've never even looked at another guy before! Leonardo: [about Casey] Who the heck is that? Michelangelo: Wayne Gretzky? On steroids? Splinter: I have always liked... cowabunga.